What does the White Lake Association do? The White Lake Association (WLA) is comprised of hundreds of area residents who care deeply about White Lake. Our members support WLA activities and actions that preserve the natural amenities of the lake, as well as the public trust. Rakes the lake bottom for invasive species plant samples for analysis which are identified and logged to record the rate of spread. 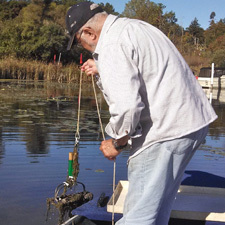 Conducts ongoing water sample testing for clarity, oxygen levels and pollutants. Maintains the weather station and video cam at the White River Light Station. Partners with the Steelheaders to install and maintain “no wake” buoys on the east and west ends of White Lake. Works to make boat launching convenient and safe at Scenic Drive and other locations. Constructed and erected a 4′ x 8′ sign alerting boaters of 40-foot and over vessels of the speed limit of 8 mph. In March of 2016 White Lake Association signed a Cooperative Work Agreement, with White River Watershed Partnership, White Lake Sport Fishing Association and White River Steelheaders. The agreement recognizes the long-term viability and sustainability of the unique natural resources of the watershed requires the cooperation and partnership of organizations already working to protect its resources. It further acknowledges the survival of the watershed is dependent upon managing the biological community, physical characteristics, chemical dynamics, as well as the integral human interactions within each of those elements. WLA, Steelheaders, WLSFA and WRWP are committed to collaborative support for the White River Watershed through the sharing of resources, education of the general public, and mutual efforts of conservation, restoration and protection.